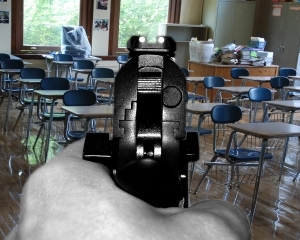 Once again, in the wake of yet another school shooting, gun advocates have suggested that the solution to gun violence in schools is to put guns in the hands of teachers. This is, to put it mildly, a really dumb idea. The biggest problem, however, is likely not what you think it is. Oh, sure, that’s a problem too, but it’s not the biggest one. The real issue with arming teachers is not that it simply won’t work. It’s not the excessive cost of training and weapons and insurance. It’s not even that putting guns in schools makes them less safe. It’s the effect it would have on the students: the normalization of guns. Seeing their teacher day in and day out carrying a weapon – or even just knowing that their teacher is armed – creates a new normal, one in which carrying a weapon is an ordinary thing. That violence is the default answer, rather than compassion or caring. The police carry guns and we know that it’s because their job (in theory, anyway) is to protect us and stop bad people from doing bad things. Yes, we know that they might need to use their weapon and we understand that it’s part of their job description. Teachers, on the other hand, are meant to be a source of knowledge and enlightenment, of emotional and intellectual support, and of a future away from gun violence. If we put guns in their hands in their classroom, guns and the violence they can replace that support and that enlightenment. They become normal. But guns should NOT be the norm. If you’re going hunting, yes, you carry a gun. If you’re going to the gun range, you’ll need your weapon. If you’re in law enforcement or the military, guns are part of your equipment. Other than that, however, guns are not an everyday item. You probably need your wallet every day. Likely your keys too. A lot of people these days feel naked without their cellphone. For that matter, most people probably ought to be wearing clothes when they leave the house. But a gun? That’s not normal. Nor should it be. If we teach kids that carrying a gun is not extraordinary, we will never stem the tide of gun violence in this country. Our teachers need to teach science and language arts and music and math. They should exemplify empathy and support, NOT that guns are the answer.